The Great Horned Owl is a large owl native to the Americas. This owl is extremely adaptable and has a vast range through many different environments. They are the most common and widespread owl in North America. 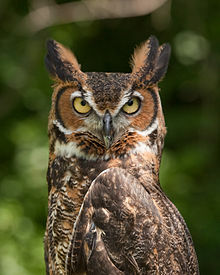 Description: The Great Horned Owl has a body length 18-25” with a wingspan of 36-60”. They have large ear tufts called “horns” and rusty facial disks with yellow eyes. Both the males and females have a white chin and throat and mottled barred brownish gray feathers. Despite their large size, they are only about 3 lbs. Interesting facts: The Great Horned Owl is very powerful and can prey on animals larger than itself including cats, skunks, and possums. Behavior and diet: Although many owls are known for being exclusively nocturnal, this owl is not and is active at dusk, sometimes during the day. The Great Horned Owl preys on terrestrial vertebrates including mammals, other birds, reptiles and amphibians. Breeding and nesting: These love birds are monogamous, staying with their partner throughout the mating season. They have 1-5 dull whitish eggs laid in winter. You will find these guys in large tree cavities, broken-off snags, buildings, ledges, open platforms. They are typically found 20-60‘ above ground. The Eastern Screech Owl is the smallest owl found here in Texas and a common and widespread owl in Eastern North America. They occupy a variety of habitats from wooded lots to urban gardens. Unfortunately, their population is in decline due to habitat loss and rodent poisons. 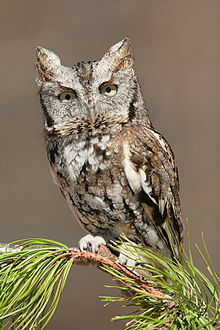 Description: The Eastern Screech Owl is a small owl with a body length of just 8-10″ with a wingspan of 18-24”. They have small ear tufts which they flatten at will, and bright yellow eyes with a pale bill. They are very tiny owls, weighing just 5.9 oz! Song: Contrary to their name, their song is not a screech but more of a drawn-out trilling note descending in pitch: “Eee-eeeheeee-eee”. This song is often described as a mournful whinny. Behavior and diet: Unlike the Great Horned Owl, the Eastern Screech Owl is exclusively nocturnal. They begin their nighttime hunting at dusk, where they prey on a wide variety of invertebrates like insects, spiders, and crayfish, and vertebrates such as small mammals, birds, reptiles, amphibians and fish. Breeding and nesting: Like the Great Horned Owl, the Screech Owl is monogamous. They lay 2-8 small white eggs. The baby Screech Owls are fed by both sexes. You will find their nests in tree cavities, nest boxes 8”x8”x16” with small 3” opening. They prefer to be 10-30’ above ground. 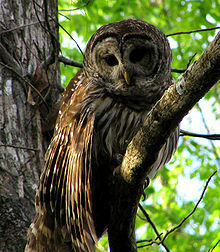 The Barred Owl can be found in swamps and riparian forests throughout the Northern United States and the South East. Their range is expanding into the Northwest areas of the country as they are losing habitat in their native regions in the South East. Description: The Barred Owl is a medium sized owl with a body length of 17-24“ and a large wingspan of 50-60”. They have a large rounded head with dark eyes and a yellow bill. You will recognize them by the horizontal bars on their breast and heavily streaked underparts. They also have a long barred tail, hence their name. This owl weighs about 1.4 lbs. Song: You can recognize the Barred Owl’s song by listening for 8 or more drawn-out notes, “Who cooks for you; who cooks for you all?” They will readily call back to imitations of its call. A group of 2 make loud, excited caterwauling. Behavior and diet: Barred Owls are mostly nocturnal and crepuscular. They can be active during the day and night. 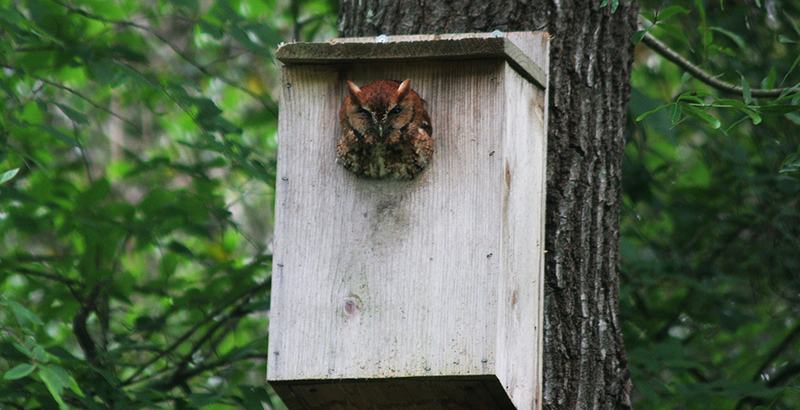 Like the Eastern Screech Owl, they prey on a wide variety of both invertebrates and vertebrates. Breeding and nesting: The Barred Owl is monogamous and may even pair for life with its mate. They lay 2-3 white eggs and when they hatch, the babies are fed by the mother and father. Look for their nests in tree cavities and empty nests of other owls. They prefer to be 15-80’ above ground. Although native to the area, the Barn Owl is rare to uncommon within our range. They are declining at a rapid rate in Eastern North America due to habitat loss. They like to occupy buildings near areas cleared for agriculture, particularly meadows and pastures. 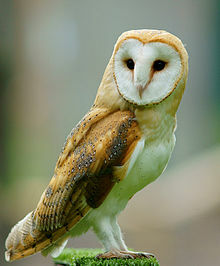 Description: Barn Owls are a medium to small owl with a body length of 14-20″ and a wingspan of 43-47”. They have a distinct heart shaped facial disk resemble “monkey face.” They have white to cinnamon underparts with spots instead of streaks and golden tawny upperparts. They also have longer legs to their body size and a barred tail. They are just a little smaller than the Barred Owl, at about 1.1 lbs. Song: The Barn Owl has a harsh hissing screaming grating whistling gasp: “eeeeeeSeEek!” Their song has been described as an unexpected gasping screech that can raise the hair on the back of your neck! Breeding and nesting: Like the other owls in this list, the Barn Owl is monogamous and may nest in any month of the year. They will lay 2-12 eggs each time they lay and the babies are fed by both parents. You will find their nests in tree cavities, barn lofts, building crevices, mine shafts, and caves. They like to be 10-30’ above ground.